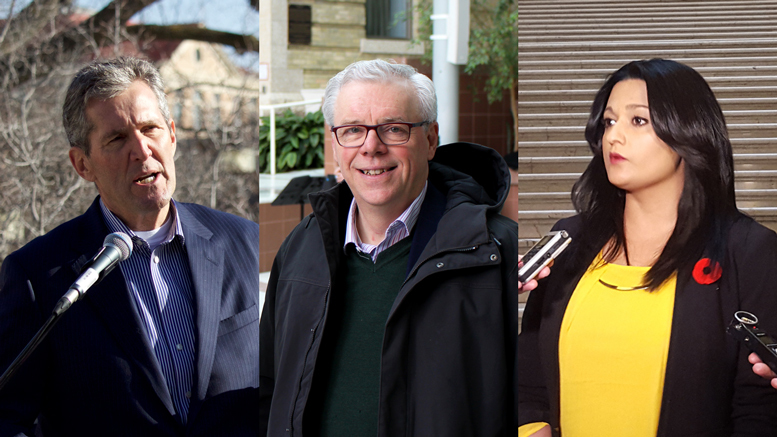 Provincial leaders Brian Pallister (PCs), Greg Selinger (NDP), Rana Bokhari (Liberals). Manitoba’s recent provincial election saw the Progressive Conservatives take an overwhelming share of both the popular vote and the seats in the legislature. But evidently not everyone was satisfied with the options available on the ballot. Rejected (spoiled) ballots were tallied at 2,462, up from 1,604 in the previous election. Declined ballots increased nearly tenfold from 440 in the last election to 4,017. A rejected ballot is deemed by a voting official to be improperly marked (whether deliberately or accidentally) or otherwise invalid. Rejected ballots do not count toward the total number of votes in the election as they are not considered validly cast. A declined ballot is registered as an official vote for no candidate. Declined ballots are validly cast and count toward the total voter turnout figures for the election. Manitoba is one of only four provinces that offers an official “none of the above” option – the others are Saskatchewan, Ontario, and Alberta. The 2016 election saw the largest number of declined ballots in Manitoba’s history. The previous record was the 1999 election that propelled the NDP to a majority after years of PC government – and in which 1,129 voters declined their ballots. Although Manitoba allows for an official protest vote option, it is a purely symbolic gesture. According to Elections Manitoba, the candidate with the most votes must be declared elected even if the majority of ballots are declined. According to Christopher Adams, a political scientist based at St. Paul’s College at the University of Manitoba, voters’ dissatisfaction with the options available was likely one of the factors driving the increase in declined ballots. In particular, Adams cited dissatisfaction with the party leaders, as opposed to the local candidates. “Some data are showing that all three leaders weren’t scoring very high on public opinion surveys. We do know from survey data at the national level over the past couple of decades that the leaders are much more important than they used to be for voters’ decision-making. So we’re oriented more and more to looking at the leaders,” he said. Another factor is media coverage. The option to decline a ballot received media attention beginning with an April 15 CBC article in which Adams was interviewed. Numerous other outlets wrote similar articles in the days following. Although some share of the rejected ballots would have been deliberately spoiled, Adams warned that rejected ballots could not be interpreted any particular way. “The law says you have to clearly indicate your choice. That’s how it’s counted. So if they kind of made some confusing choice you can’t really clearly tell which candidate they’re choosing, where that X belonged,” Adams said. Adams said he thinks there is some value in having the option to make the symbolic gesture of declining a ballot. He compared it to voting for a small party that’s unlikely to win, like the Green Party. “In a way, by declining to vote, you might be making a statement of saying ‘I’m not rejecting the right to vote, or the power of the vote. What I’m rejecting are the offerings of what’s been provided to me here,'” he said. According to unofficial results provided by Elections Manitoba, the total number of declined ballots was 4,017, while rejected ballots were tallied at 2,462. Both rejected and declined votes were distributed fairly evenly across the province. The Lakeside and Southdale districts tied for most declined votes at 164. In a close second were Radisson and Riel, tied at 158. Thompson and Swan River had the lowest number of declined votes, at five and seven respectively. Kewatinook, which was won by the Liberals in an upset, led the province with 120 ballots rejected, with Lac du Bonnet in second with 101. Fort Garry-Riverview had just 13 rejected ballots for the lowest in the province, while Morden-Winkler had 14. No race was close enough that the number of rejected ballots would have made a difference. However, the Elmwood district in Winnipeg’s east end went to NDP candidate Jim Maloway by a margin of only 107 votes. Elmwood had 136 declined ballots.